One of the things that surprises me about BizTalk installations is, in my experience, the limited support they receive once a project has gone live. BizTalk is a large enterprise product and a dedicated team of BizTalk operational specialists and SQL Server DBA’s should be created for the task of maintaining operational and test environments. In this blog-post, I’ll run over some of the responsibilities that I believe a BizTalk operational support team need to focus on to maintain a healthy, responsive and available BizTalk environment. Responding to and actioning monitoring software (e.g. MOM/SCOM) alerts, including errors, warnings and performance issues, in a timely manner. Managing suspended instances to ensure that these do not grow out of hand and cause performance problems. Where suspended instances are caused by development bugs, triage and liaise with development to roll-out patches as necessary; where they are the result of misconfiguration, address any problems. Identifying and apply BizTalk Hotfixes to all environments as necessary. A good place to start is the Microsoft RSS feed for BizTalk 2006 KB articles. Note: this RSS feed appears to be time-based and may not always have entries (thanks to Nikolai for pointing this out). Understanding BizTalk throttling and tweaking parameters as necessary based on historical performance statistics and knowledge of the product domain (e.g. does the application need to handle larger volumes during certain times of the year). Ensuring that the TDDS Tracking Service is running and that tracked messages are being moved to the Tracking Database. Maintaining BizTalk Hosts and Host Instances, provisioning and decommissioning as necessary. Maintaining Adapters, installing and installing as necessary. Understanding options for scaling-up and scaling-out of the application tier; perform scaling as required, before performance becomes an issue. Understanding some of the underlying developer-orientated concepts, including subscriptions, pipelines, maps etc. ; a good understanding of the Orchestration debugger is also crucial. Becoming one with the MsgBoxViewer tool to identify potential performance issues before they happen. Running the BizTalk 2006 Best Practices Analyser at regular intervals to identify any non ‘best-practice’ issues. Managing third-party adapter tools that interface directly to BizTalk, such as the Covast EDI Accelerator. Maintaining operational documentation, including known issues, fixes and resolutions – a Wiki is an excellent resource to manage this knowledge. Scripting as much as possible, particularly known, reoccurring situations. E.g. WMI scripts to clear-down any ‘harmless’ known suspended instances, such as zombies. The more that is scripted, the less chance of manual error. Scripting can either be performed in PowerShell, VBScript or C#. Maintaining all scripts, bindings and configuration settings in source control to ensure proper versioning. Ensure all environments are updated with the same version of the tools. Performing deployments (and have sufficient knowledge of BizTalk, SQL Server and the product domain to make decisions on deployment issues without having to go back to the development team). Ensure that the BizTalk SQL Agent jobs are running successfully and are not running for an excessive length of time. Ensure that tracking data is cleared down using the Purge and Archive jobs and that historical archive data is made available in an offline mode (i.e. on a different SQL Server) for analysis and reporting. Ensure that backups are taken, using the BizTalk Backup job, and that the resulting backup data and log files are verified. Monitor performance of SQL Server environment through a monitoring tool to ensure that the server/s are not exceeding CPU, memory or IO load; scale-up or -out as necessary. Monitor replication performance and/or automagically restore backups to a DR environment, to ensure continuity of service in the event of downtime; respond to any incidents that arise in the restore. Understand what can and more importantly what can’t be done on a SQL Server that is hosting BizTalk. Understand options for scaling out the database tier and in particular, the Message Box; perform scaling as required, before performance becomes an issue. Identify and apply SQL Server Hotfixes to all environments as necessary. I would recommend that DBA’s also read the excellent Microsoft KB Article How to maintain and troubleshoot BizTalk Server databases. Switching the live environment over to disaster recovery at regular intervals (every quarter / every six months) to prove the disaster recovery plan and to give confidence to the business. The switch to DR should be for a short period – 1 to 2 days – during a period of known ‘slack’. Switching to DR should be straightforward and (almost) entirely automated to ensure manual error is minimised. Where there are problems with the plan, refine as necessary. Keep the master recovery document on a Wiki for example, but ensure an up-to-date hardcopy is kept off-site. Ensuring that all members of the team have confidence in the plan and are prepared to invoke it as necessary. Application of Windows Updates as necessary during scheduled down-time. After creating new environments, run the BizTalk 2006 Best Practices Analyser to check for any non ‘best-practice’ issues. Liaising with infrastructure team to ensure environments are correctly built before operation commences, including correct SAN RAID configuration, clustering etc. Work with DBA’s to ensure that the layout of data and log files is correct based on the role of the databases (BizTalkMsgBoxDb vs. BizTalkMgmtDb for example). Ensure elements of the environment (e.g a BizTalk Server / A SQL Server node etc.) are cleanly removed before downtime commences to actioned failed hardware. Liaising with networking team to ensure necessary ports are open on firewalls etc. for traversal of traffic for both the underlying SQL Server Infrastructure and external access. Liaising with security team to ensure correct Active Directory Domain users and groups are created and maintained to ensure a well running system. For those of you who are a member of a BizTalk operational support team (or as a consultant), are there other recommendations you’d like to share? Before Hyper-V, if you wanted to run BizTalk in a virtualised, enterprise-grade environment, there was really only one option – VMWare‘s ESX Server*. Unfortunately, there was one great big caveat: Microsoft wouldn’t provide you with support (you had to re-create the problem on physical hardware, which was simply too much bother, before they would offer support). Now we have Microsoft’s Hyper-V, a true first-class bare-metal virtualisation platform and everything has changed. The BizTalk licencing model is simple – buy a licence (standard, enterprise etc.) for the number of physical processor slots you have in the system. 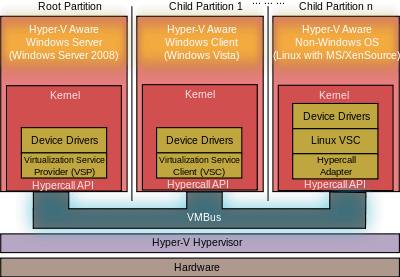 With the introduction of Hyper-V and the ability to run several instances of BizTalk Server 2009 on virtualised instances of Windows Server 2008 we can run, for example, four BizTalk Servers on two physical machines, using just four processor slots, rather than the traditional four physical machines and eight processor slots. An immediate 50% saving on licencing. Want to provision more BizTalk Servers for a different BizTalk Group on the same hardware? sure, you’ve already paid for the licences on the two machines, so simply launch the images and configure. There are of course new licencing details to take into consideration, which are fully detailed on the MS Volume Licencing pages. In a nutshell, if you buy Windows Server 2008 Enterprise, you are entitled to run up to four virtual instances at a time under a single server license. There are no specific details for BizTalk Server 2009 yet, but based on comments by Burley Kawasaki, the licencing model looks set not to change. BizTalk always was at a competitive price point, but the marriage with Hyper-V now makes it a much more compelling solution, especially in highly-available, scale-out scenarios. If you want to read more about BizTalk Server 2009 running on Hyper-V, I recommend Chris Romp’s recently blog entry BizTalk Server 2006 R2 Hyper-V Guide. * Ok, so you could run it on Virtual Server 2005, but you wouldn’t do that for an enterprise system, would you….? Joy of joys, more subscriptions problems to debug this week with some unexpected results. Microsoft.XLANGs.Core.PersistenceException: Exception occurred when persisting state to the database. ---> Microsoft.BizTalk.XLANGs.BTXEngine.PersistenceItemException: A batch item failed persistence Item-ID dbbd66a3-d748-4051-a238-fea9509efcf4 OperationType MAIO_CommitBatch Status -1061151949 ErrorInfo The message found multiple request response subscriptions. A message can only be routed to a single request response subscription. . ---> Microsoft.BizTalk.XLANGs.BTXEngine.PublishMessageException: Failed to publish (send) a message in the batch. This is usually because there is no one expecting to receive this message. The error was The message found multiple request response subscriptions. A message can only be routed to a single request response subscription. with status -1061151949. With the actual error in bold above – multiple request-response subscriptions were found which aren’t allowed (I’m not running 2006 R2 and don’t have KB923632 installed). My solution employs an orchestration which consumes a web-service over a dynamic solicit-response port; the port itself has been created using early-binding (creating one of those ugly port names). Digging into those subscriptions, I discovered two subscriptions that are exactly the same for the SOAP adapter – no wonder we have multiple request-response subscriptions…..
Apart from hacking the database to remove this unwanted subscription entry, I could find no way of updating the subs. on this dynamic port. Interestingly however, creating a new dynamic port from the Admin Console and binding that to the orchestration resulted in the correct number of subscriptions and a working solution. I’m wondering then where the bug is: I don’t think it can be when the early-bound ports are created during deployment as the subscriptions themselves aren’t created until the port is enlisted, which (AFAIK) happens in exactly the same way for manually created send-ports. The the problem is only evident on early- and not late-bound ports! I’m now toying with the idea of KB923632 so we don’t have to worry about this issue again, but I’m keen to understand why this is a problem in the first place, so I’d also be pleased to hear from anyone who knows of a Hotfix that addresses this duplicate subscription issue. I also think its a good one to keep in the back of your mind in-case you encounter any ‘interesting’ subscription issues. The Case for a New Tool? One final thing on this: diagnosing subscription problems really raises the need for a ‘Subscription Finder’ tool. We currently have the Subscription Viewer in the Admin Console, which is great, but we have to know what subscriptions we are looking for in the first place. What would have been really helpful here would be a tool where I can enter the details of the promoted properties from the Failed Routing Report and the tool locates all subscriptions that would match those properties. I am looking at putting together such a tool, so watch this space. 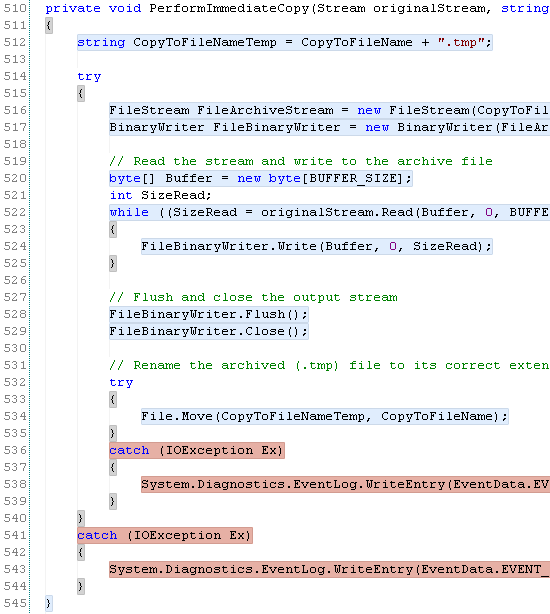 Some interesting BizTalk compiler hints, well not quite…. I’m surprised that this doesn’t throw an error as including a General catch block as the first ‘catch’ is bad practice: the first catch clause that specifies the exception type is considered a match and a general catch clause is considered a match for any exception type – if you have a General catch block as the first block, this will catch all exceptions, irrespective of type, possibly giving unexpected results. The maximum number of convoy set properties has been exceeded. A convoy set can only contain up to 3 properties. This one was a bit of a show-stopper for me earlier this week. Suppose you have an envelope schema that is used to debatch messages and you need to promote properties fromthe debatched schemas into the context of those individual messages – it would appear that properties will not be promoted into the debatched messages. Yikes! I need to do some more investigation on this, but I’m presuming its something to do with the same XML disassembler issues Charles Young wrote about back in October 2004! The disassembler component parses each document within the envelope. For each document, the BizTalk message object is created with its own context where all the properties promoted from the envelope and from the document itself get copied. The XML Disassembler only processes data in the body part of the message. Thus, only properties from body part can be promoted. Again, I need to check this out, but what I think I’m reading here is that if the document schema and property promotions on that document schema are defined in the envelope schema (bear with me here….) and the document schema itself is referenced from the envelope schema, we should get promoted properties! I’ll try this out tomorrow…. So how do you move versioned directories to another location in the repository? Once the directory has been moved, commit the changes as usual. A Question for the BizTalk Guys over at the PDC…. I’ve been reading all about Azure and Oslo, but I’ve yet to read anything concrete about Dublin – are you guys picking up any detail on what it will offer? Have you seen any demos on actual usage? Update: May have answered my own question with a bit more research: Darren Jefford and Maina Donaldson have good explainations over on their blogs. I discovered NCover over the weekend and wow, am I a fan! 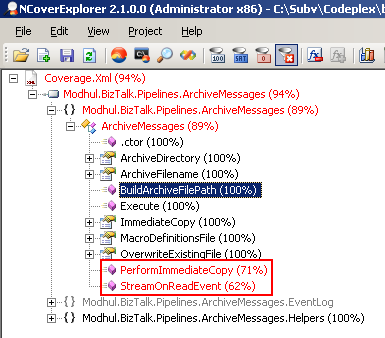 ncover.console "C:Program FilesNUnit 2.4.8binnunit-console.exe" BizTalkMessageArchivingComponent.Tests.dll //ea Modhul.BizTalk.Pipelines.ArchiveMessages.Attributes.NCoverExcludeCoverage //et "Winterdom.*;BizTalkMessageArchivingComponent.Tests. 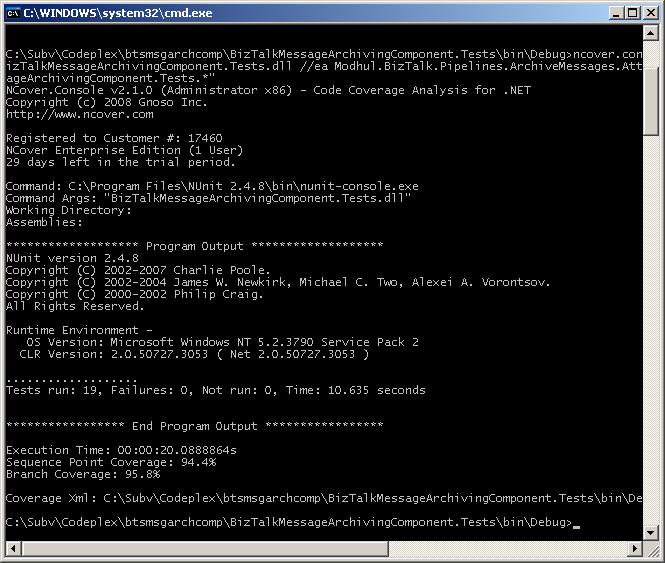 *"
NCover has now determined the code coverage based of your unit tests and produces a Coverage.Xml file. This file contains information relating to the code coverage and can be loaded in the NCover.Explorer tool to produce a VS like environment that displays lines of code that were touched and un-touched by your unit tests. Based on this information, we can now create tests to cater for these exceptions, ensuring we have 100% code coverage. NCover is an excellent tool and although it isn’t free, I personally think its a must-have for any developers tool-kit.